Does smoking affect oral health? By now, everyone knows that smoking is bad for you. But the truth is its broad-reaching health effects are not all known by everyone. This is especially true of oral health. Smoking can have serious repercussions in this regard. To give you a better idea of how smoking can affect your oral health, Drs. Jennifer Kim, Brandon Eash, Edmond Massabni, Yunji Lee, and Rajshree Mulay and our team have listed some issues that can arise. Oral cancer can have steep ramifications for anyone that gets it. Surgery can be required to eliminate the cancer before it spreads to more vital parts of your body. Any type of cancer is about the worst health effect you can get, and this especially holds true to the affects that smoking has on your mouth. The type of mouth surgery required with oral cancer can leave your face deconstructed in certain areas, and it is all due to smoking or use of other tobacco products. At the very least, it is fair to say that as a smoker you will often have bad breath, and while you may try to cover it up with gum or mints, tooth discoloration is a whole other story. The chemicals and substances in cigarettes stick to your teeth staining them brown and yellow colors that are increasingly difficult to disguise. Another effect of smoking is the increased risk of gum disease. Your gums may start to recede, which can eventually lead to the loss of teeth. Smoking can also increase bone loss and density in your jaw which is vital to the health of your mouth. Gum disease and bone loss are two signs that smoking is definitely bad for your mouth. When it comes to the health of your mouth, the question is not whether smoking affects your health, it's how does it affect your health and to what degree. If for no other reason than because smoking involves your mouth as its entry point, it is safe to say that it can have long-lasting and detrimental consequences on your oral health. 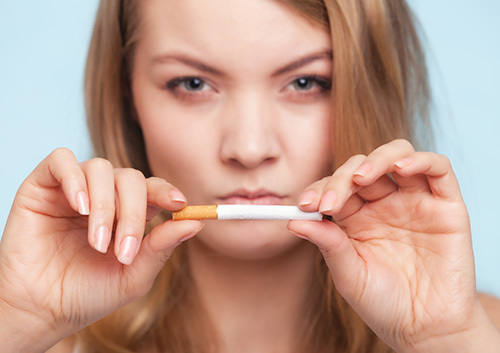 To learn more about smoking and your oral health, contact our Milford office to schedule an appointment with Drs. Jennifer Kim, Brandon Eash, Edmond Massabni, Yunji Lee, and Rajshree Mulay.